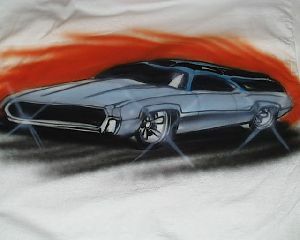 2 DOOR SUISIDED WITH A CHOPPED OLDSMOBILE VISTA CRUISER WAGON ROOF. THE BACK HALF OF THE ROOF IS REMOVEABLE.SO IT LOOKS LIKE A RANCHERO. THE CAR WAS ORIGINALLY BUILT BY A GUY NAMED DALE GOULD WHO OWNED A MUFFLER SHOP IN N.HOLLYWOOD CA. AND ALSO BUILT CARS FOR GEORGE BARRIS. BACK IN 1973 OR 74 HE BUILT THIS CAR AND DROVE IT EVERYWHERE. I SAW IT ONE TIME AT BARRIS SHOP AND FELL IN LOVE WITH IT AROUND 1975. I NEVER SAW THE CAR AGAIN UNTILL 1996 SITTING IN THE BACK YARD OF A SHOP IN SAUGUST CA.MIKE FENNELS SHOP A CAR RESTORATION SHOP. I ASKED WHO OWNED THE CAR AND IF HE KNEW THE HISTORY OF THE CAR. HE DID AND HE KNEW WHO BUILT IT.HE PUT ME IN TOUCH WITH THE GUY WHO OWNED IT AND IT TOOK 7 YEARS FOR ME TO AQUIRE IT. NOW I AM STARTING TO BUILD THIS CAR THAT I HAVE ALWAYS WANTED.I HAVE ALL SORTS OF PLANS FOR THIS CAR AND RECONSTRUCTION IS STARTED ALREADY. THE CAR NOW IS IN BLACK PRIMER. IT WAS TUFF STRAIGHTENING OUT AFTER BEING A PLANTER IN THE DESERT FOR ALMOST 20 YEARS.THE PHOTO I AM LISTING IS A RENDERING FROM AN ARTIST NAMED TOM NI FROM THE BAY AREA. BECAUSE I DON'T WANT ANYBODY TO SEE THE CAR YET. THE GUY THAT BUILT THE CAR IN THE 70S IS ALSO KNOWN FOR BUILDING A FAMOUS 1960 CADDY WITH A 1967 TARGA"D & CHOPPED IMPALA ROOF THAT HAD A METAL FLAKE BLUE PAINT JOB. THAT CAR HAS DISSAPPEARED AND FROM WHAT I UNDERSTAND THERE IS A REWARD FOR FINDING IT. I ALSO HAVE PHOTOS OF THAT CAR. NOW HERE'S THE CATCHER.I AM REBUILDING THE TBIRD WAGON AT GEORGE BARRIS' SHOP IN NO. HOLLYWOOD WHERE I FIRST SAW THE CAR 30 YEARS AGO. SO MY HEART IS REALLY IN THIS.